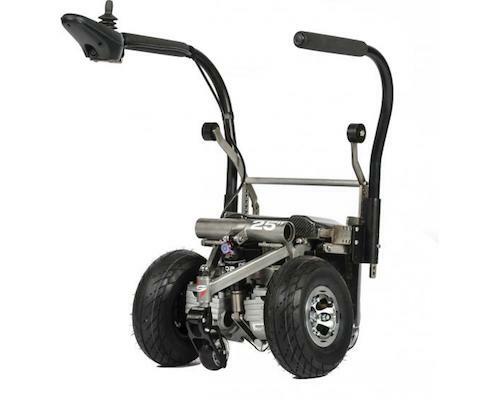 The ZX-1 provides power assist to active users of manual wheelchairs. This Device significantly reduces the affects of prolonged pushing and pushing a manual wheelchair over difficult surfaces like carpet, grass and hills. The ZX-1 adjusts to your manual chair without requiring changes to the seating configuration to operate. It is compatible with most rigid frame and folding wheelchairs. The Development of the ZX-1 Power Add-On Device has taken place over a period of 5 years. It is the only Power Assist Device that requires no tools or assistance for attachment, enabling you to leave the Power Assist Device behind when it is not needed. Due to it’s small size and weight it makes airline travel easy, and the optional travel case ensures that you can arrive at your destination without the worry of your power chair being damaged.